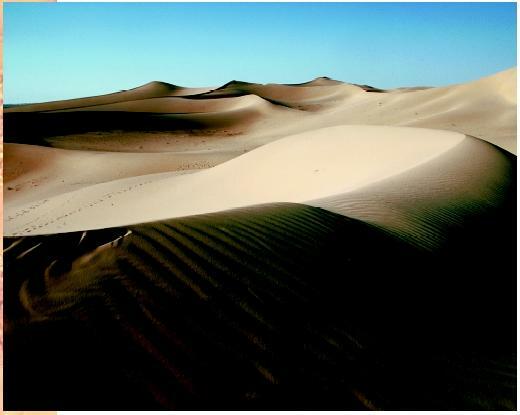 Deserts are environments shaped by aridity, or dryness. Aridity reflects the balance between precipitation and potential evapotranspiration (PET), or the air's ability to absorb water (determined by temperature and water content). In arid zones, precipitation may be 5 to 20 percent of PET; semi-arid regions receive more precipitation, and hyper-arid regions less, in relation to PET. Roughly one-third of Earth's land surface is arid or semi-arid. The major desert regions are: Australia, western North America, western South America (Atacama), southern Africa (Namib), and Asia-northern Africa. There are so-called polar deserts; however, most arid lands are in the warm subtropics. There are two primary causes of aridity. One is the subtropical highpressure belts, where high altitude air masses move away from the tropics. Tropical heat causes air to rise and cool, and therefore drop moisture as it moves away from the equator. The air then becomes more cool and dense. This air then sinks, warms as it nears the surface, and regains the ability to absorb water, thus creating zones of aridity. A second cause is the rainshadow effect caused by mountain ranges. Continental interiors are dry because most air masses have moved long distances or over mountains and in doing so have lost water. Desert conditions may be quite harsh. Intense solar radiation and lack of shade cause surface temperatures as high as 50 degrees Celsius (130 degrees Fahrenheit). Limited precipitation and rapid evaporation greatly limit plant growth, and water is rarely available for animal consumption. Precipitation is predictable in some systems (such as winter rains in California's Mojave) but nonseasonal in others. Many sites experience long rainfree periods; in portions of the Atacama, rainfall has never been recorded. Variability is another characteristic of deserts. Precipitation is episodic; rainstorms may be quite intense, with much of the annual total falling in just minutes. Similarly, resources may be spatially patchy. Arroyos or erosion channels and low spots may collect runoff from surrounding areas; rockiness and soil surface crusts contribute to runoff. Seeds and litter accumulate and support plant growth in low, relatively moist locations. Permanent water sources (desert springs or oases) are rare but important. Evaporation draws water from the surface, leaving dissolved minerals as a salty crust. Sparse plant growth adds little organic material to the soil; thus the soil has limited capacity to retain water and minerals. Sparse vegetation also increases the erosional influences of high wind, runoff, and extreme temperatures. Sand dunes are accumulations of eroded materials; their instability makes them harsh environments for most organisms. Shadows form on the El Oued dunes in the Sahara Desert in Algeria. extract water from coastal fogs: The beetles do "headstands" on dune ridges, and moisture condensing on the beetle's textured carapace trickles down to the mouth. Kangaroo rats obtain virtually all of their water by oxidation of fats in dry seeds (metabolic water). Other adaptations involve water retention: storage of water in succulent tissues; specialized photosynthetic processes minimizing water loss; leaflessness, small leaves, or leaf loss during drought, also reducing plant water use; and animal use of burrows or shade. Finally, some organisms simply tolerate tissue dehydration. 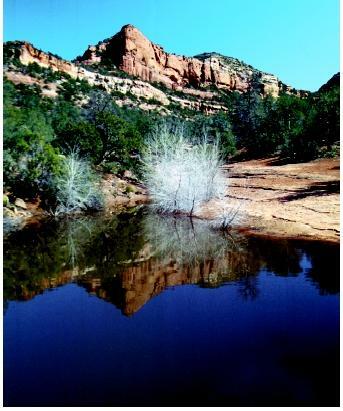 A high desert oasis in Sedona, Arizona. nomadic or migratory, finding temporary patches created by local rainfall: These include large mammals such as antelope, birds, and even insects (for example, desert locusts or grasshoppers). Arid and semiarid regions have been important for livestock grazing throughout history. As energy sources have made irrigation feasible, some regions have been converted to cultivation. Urban populations are increasing rapidly where groundwater or river water is available and affordable; the southwestern United States, for example, contains several rapidly growing metropolitan areas in desert, such as Phoenix, Arizona. Depletion of underlying groundwater is a major environmental consequence in such areas. Cooke, R. U., A. Warren, and A. S. Goudie. Desert Geomorphology. London: UCL Press, 1993. Louw, G. N. and M. K. Seeley. Ecology of Desert Organisms. New York: Longman, 1982. Mares, M. A., ed. Encyclopedia of Deserts. Norman: University of Oklahoma Press, 1999.